Sutton Coldfield covers twenty square miles, and some parts of it are remote from most residents. To the south, a short stretch of the boundary is formed by the river Tame – perhaps the first settlers arrived by water thousands of years ago, and a river frontage was still important to the Manor of Sutton in Saxon times? Severn Trent Water now occupies the part of Sutton lying between the river and Kingsbury Road, but in the nineteenth century this was farmland. In the middle ages the land was farmed by the inhabitants of two tiny hamlets, Wigginshill and Greaves. Wigginshill is still there, up Wigginshill Lane, but Greaves has almost entirely disappeared, the only survivor being Minworth Greaves Farm on the north side of Kingsbury road a few yards east of Wigginshill Lane. When the farm and its outbuildings were being converted for housing, a detailed historical survey was made of the old buildings. The farmhouse was a Georgian brick building, and there was an old timber-framed barn dating back to medieval times. The survey, made in 1999, concluded that there had been a farm on the site since the thirteenth century, although most of the existing buildings dated from after 1800. In 1900 some of the other old buildings of Greaves were still standing, including, on the opposite side of the road, an old farmhouse which had been altered to form three cottages for farm workers. In 1911 this was a ruin awaiting demolition, but it was known that inside the brick shell were the remains of the medieval timber-framed farmhouse. This timber framework with its cruck beams was carefully dismantled and stored away. It had been purchased by George and Lawrence Cadbury with a view to reconstructing it at the new Garden Village of Bournville. Cadbury’s had already moved the old timber-framed Selly Manor House to their Bournville site, and it was there in the 1930s that the old timbers from the house at Greaves were used to create the splendid medieval hall house known as Minworth Greaves, opened to the public in 1932. 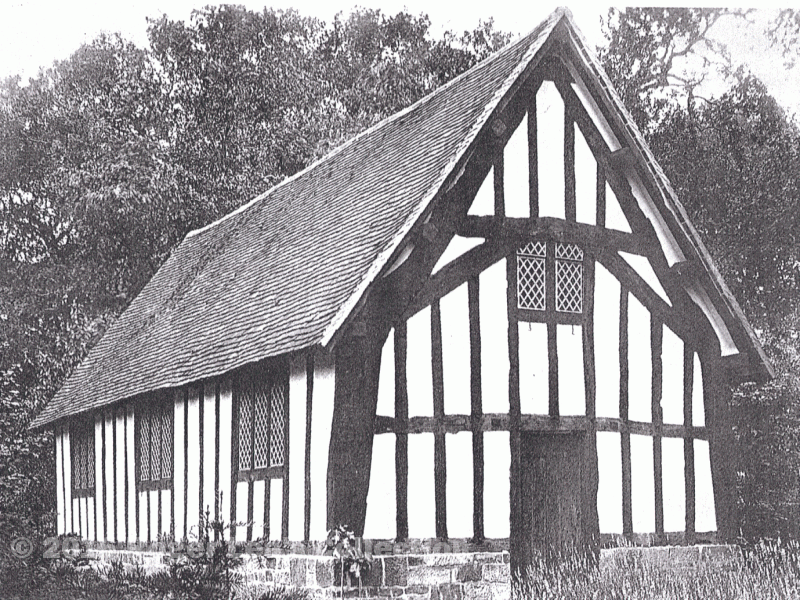 Thus the only Sutton timber-framed house which is open to visitors is now part of the Selly Manor Museum at the corner of Maple Road and Sycamore Road on the other side of Birmingham. 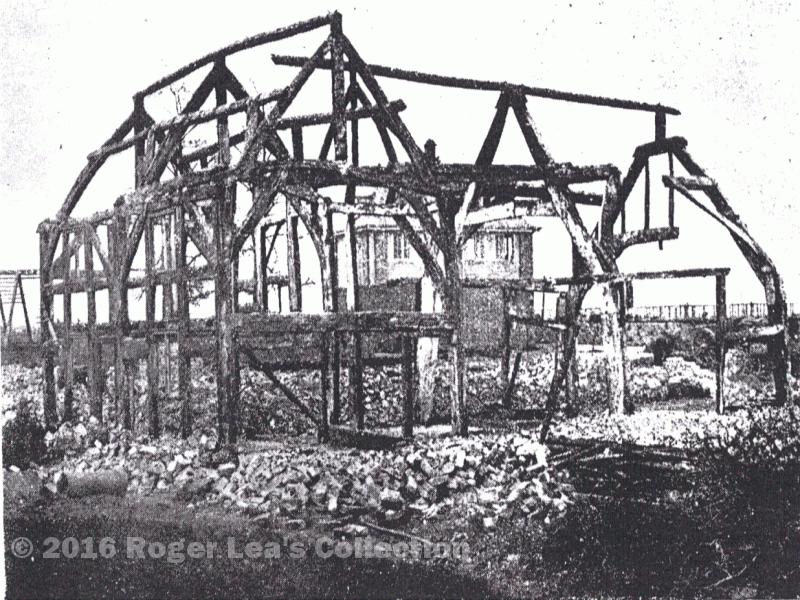 The framework of the house at Minworth Greaves before dismantling, taken in 1911. The restored house at Bournville Village.